We recently had the opportunity to chat with Koady (the banjo player) and talk to him about their latest project, their sound, and their crazy schedule. It was a sincere pleasure to get to know them, and we can’t wait to see them perform live. Here’s our conversation with The East Pointers. 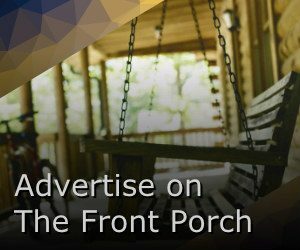 Front Porch (FP): Your music seems to be a perfect marriage between contemporary country music, folk, and Celtic music. One might say that your sound is deeply Canadian. When did the three of you get together, and how did you find your sound? Koady: We’ve known each other for a pretty long time. Tim and I are cousins so we grew up playing music together since we were 5 years old. We met Jake on the folk music scene in Canada and often found ourselves hanging out and playing tunes whenever we were in the same city. We joked about a band until we actually had enough time to record a little EP, we’ve been on the road pretty much ever since! FP: You are known for your live performances. What is it about live performance that gets you so energized? Koady: For us the energy comes from the crowd. You can’t help but get excited when you start playing and people are bouncing, grooving, smiling. It’s the best feeling in the world. We’ve been lucky to get to share a lot of amazing nights with people all over the world. FP: Your sophomore album “What We Leave Behind” is really great. What was the recording process like – do you enjoy getting into the studio, or do you prefer to be out on the road and feeding off the energy of a live crowd? Koady: The recording process was similar in a lot of ways to our first album Secret Victory. We recorded the instrumental tracks live off the floor, just the three of us in a room at the Sound Emporium in Nashville. It’s a great way to try and capture the energy of tunes. We were lucky to get to work with Gordie Sampson, who is an absolute legend to work with. He’s the perfect mix for what we’re doing with the band. He’s from Cape Breton and is an amazing trad player and he’s also an amazing songwriter and producer. It was a pretty great experience. FP: Your first album rightfully landed you a JUNO award, Canadian Folk Music Award, and you recently won 4 Music PEI Awards. Did all of that boost your confidence when you were planning your latest album, or did it add a sense of pressure? Koady: I think it’s important not to get too caught up in the award side of playing music. It’s nice to be recognized but at the end of the day it’s not a competition and the point of playing music (for us) is to spread the good vibes around, send people away from a gig happier than when they came. We were fortunate to win with ‘Secret Victory’ but we didn’t really have that in mind when we recorded ‘What We Leave Behind’. Koady: People, places, things. We consider ourselves very fortunate to get to travel around the world, playing music and visiting different places pretty near every night of the week. Our songs and tunes are largely inspired by the experiences we have while on tour. It’s nice to get to write a song about Tasmania or write a set of tunes about a failed surfing expedition in New Zealand! Koady: We’re loving anything to do with Liz Stringer, she’s such a legend. Jordie Lane’s new album is an absolute gem. Trad Attack is a fun band to hit the pavement to. There’s so much great music coming out of Canada too, Donovan Woods, The Once, Leif Vollebekk, Vishten. Always a tough question! FP: Your tour is set to end in November – what do you have planned for the Winter? More music, time to relax, or what? Koady: Canada tour ends in November then we’re off to Japan for a tour in early December, back to Canada for a NYE show then we’re starting the recording process for our new album in early 2019. It’s going to be a busy winter! The East Pointers are a JUNO Award winning Canadian Roots/Folk band from the East Coast. They have been able to connect with audiences right across the globe, making new, original roots music the hippest, most vibrant thing going. The band consists of: Tim Chaisson (fiddler/singer), Koady Chaisson (banjoist), and Jake Charron (guitarist). Together, these three artists make music that takes you away – it transports you to the East Coast. Check out their website to see for yourself when they’re performing in a venue near you.